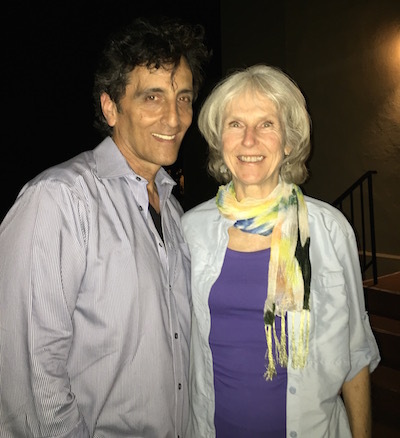 This week I had pleasure of attending the Monday Night Vegetarian Dinners in Palo Alto, CA with my friend Patricia Joy Becker. The dinner was sponsored by the Peninsula Macrobiotic Community where head chef Gary Alinder has been preparing macrobiotic meals since the group’s inception in 1987. The Macrobiotic diet is similar to a whole food plant-based (WFPB) diet emphasizing locally-grown, non-processed foods: grains, legumes, vegetables, sea-vegetables, fruit, seeds, nuts and a variety of fermented foods. In macrobiotics, any and all foods can be consumed depending on the person’s constitution and condition. A person’s lifestyle, health issues and the climate they are living in also has a strong determining factor as to what foods will provide optimum health. Macrobiotics offers dietary and lifestyle guidelines based thousands of years of oriental wisdom. After dinner, special guest speaker Verne Varona treated the audience to his lecture entitled “Dare to Laugh! Discovering Humor in Everyday Life.” Verne has been promoting a healthy lifestyle for over 35 years through his lectures, workshops, and one-on-one consultations. In addition, he is the author of Nature’s Cancer-Fighting Foods and Macrobiotics for Dummies. He studied with Michio Kushi, macrobiotic teacher, author, and leader who brought the macrobiotic message from Japan to the United States in the 1950s. Watch funny movies like Norman Cousins who found that his belly laughing by watching Marx Brothers movies would temporarily eliminate his pain. Verne’s parting advice – find things to laugh about, look for the humor in everyday life and reap the health benefits of being present. This entry was posted in cancer, Vegan, Whole food, plant-based and tagged Macrobiotics, Michio Kushi, Monday Night Vegetarian Dinners in Palo Alto, Patricia Joy Becker, Peninsula Macrobiotic Community, Verne Varona. Bookmark the permalink. Love to Laugh! Thanks Mary for writing…thanks Verne for reminding us the value of humor.